Keith Newstead (b. 1956) studied at Barking College of Art and Technology. After short-lived careers on a paper round in Finland and as a Graphic Designer, he became a motorcycle despatch rider in London for 10 years. During this time he also made and sold Jewellery. Keith counts his childhood memories of the machines in the Penny Arcade at Southend, as being one of the most important influences on his work. 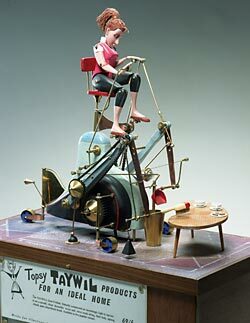 When he saw a TV film on David Secrett (Automata Maker) he was inspired to start making his own machines. His work on display at Cabaret Mechanical Theatre includes The Invasion of the Body Snatchers. This is a peep-show which depicts a train carriage of city-types on their way to work when one of them mysteriously transforms into an alien. 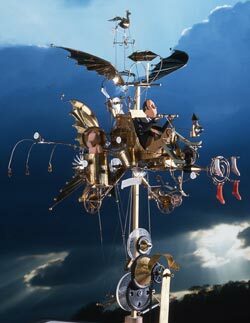 Recently he has begun designing automata for manufacture by CMT crafts people in limited editions. This enables him to concentrate on one-off and coin-operated pieces. 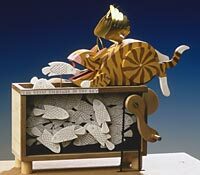 He has also produced many mechanical card cutouts. 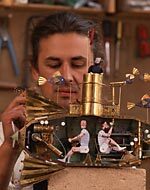 There was a time when Keith was described as a newcomer to the field but the reality is that he spent nearly 10 years, prior to that time, acquiring the necessary skills before he was able to produce his automata successfully.